Hi everyone, a quick update from Langara Island and the Clubhouse, before the generator is switched over and I lose my internet connection. 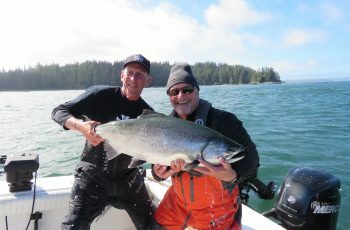 A 39 lb tyee was taken out at Cohoe Point in the deep water fishing deep off the rigger in Pred 2. 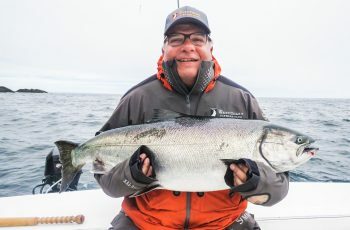 Kevin Adams was the angler and he took the fish in the am somewhere offshore in the North West winds and rolling seas. This is the top fish of the trip thus far and will be tough to beat. We are all waiting for this wind pattern to change, sooner the better! 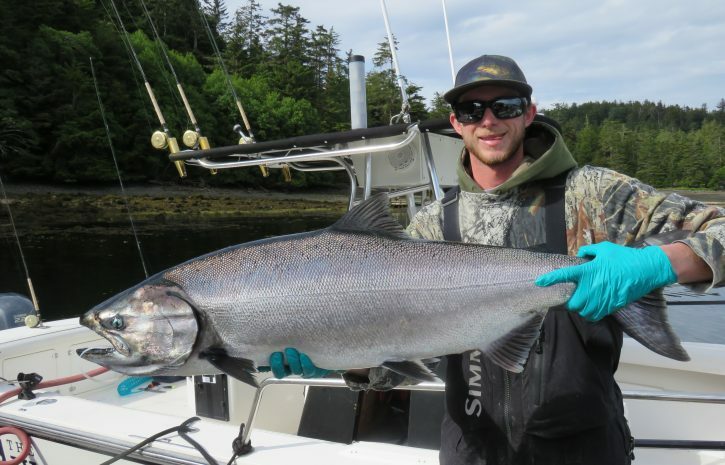 The fish seem to only be holding between Cohoe Point and Andrews, and the majority are deep fish, 90 to 160 feet off the trusted Downrigger. There is lots of feed in the area, and the whales and sea lions are in there too, feasting and putting on a show. The Lions were on full patrol today, they hammered us in the am, some of us losing a half dozen fish or more. There were herds of them, hordes, packs, roaming and foaming from the mouth on every hook-up. 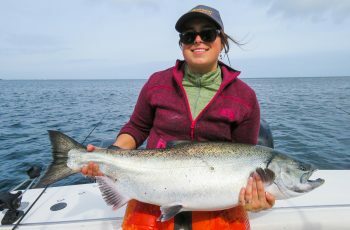 That said fishing has been pretty good for a couple days now, some boats getting into a dozen chinook, although most of these fish are in the teens. 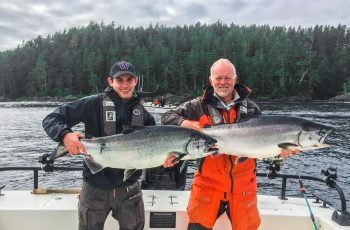 There are now fish showing in the low twenties in some numbers, although most guides saying anything over 20 is a good fish for sure. The wind has us all hunkered down between Andrews and Cohoe, there has been standing waves off the reef at Andrews pushing ten feet. The wind also has been tough on our propellers, yes, miles of line spun around prop shafts, good times. So important to cut ALL line off the shaft before running. Once the line melts and destroys your seal, water can enter the leg and that is a huge problem, goodbye lower end! This wind has also shut down hali fishing for the most part, but is forecast to switch around to a moderate southeast by the weekend. Gunia and Boulder are quiet, as is the REEF. The Hippas are not here yet, or are hiding from us at this point, we are looking but patience is needed right now. 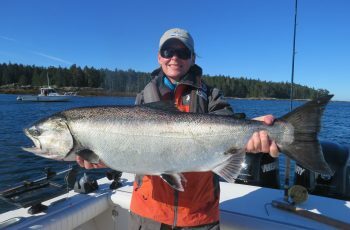 Plenty of Coho in the area to keep you alert and changing the bait, the pinks have finally slowed down. fishing got any better Mike? Sounds encouraging, Mike. Get rid of the winds before I come, and keep a few big ones for me. Hey, some size rolled in the pass this pm…stay tuned, heard of a 43, a good start ! The wind died as well, game on!